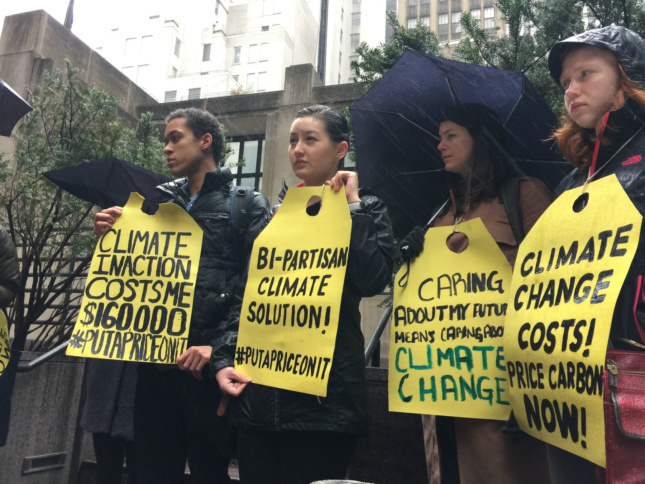 Yesterday, activists associated with Our Climate and the #PutAPriceOnIt Campaign gathered on the rain-soaked fifth-floor terrace of Trump Tower, an elusive privately-owned public space (POPS), to host a teach-in on climate pricing. 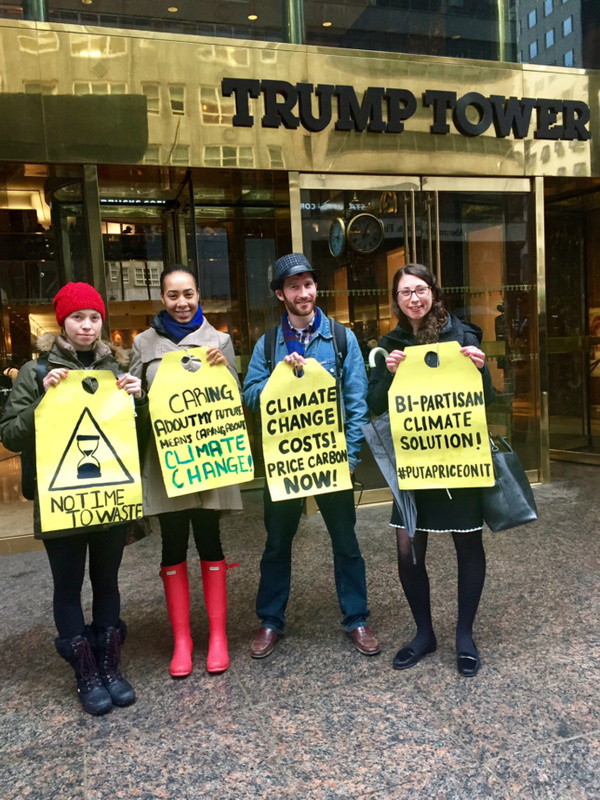 The attendees, many college students, were critical of President Trump’s policies related to climate change and initially had to ask the building supervisors to unlock the space which—by law—must be freely accessible to the public between 8am to 10pm daily. 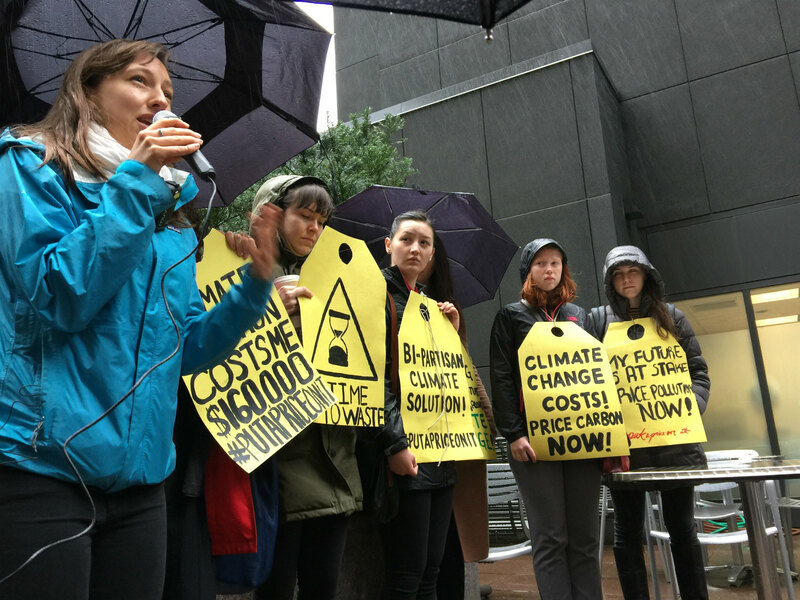 This is not the first challenge activists have experienced gaining access to the space: recently The Architect’s Newspaper (AN) reported that a similar teach-in was almost thwarted by building officials who cited the un-shoveled snow and icy conditions as hazardous. As stewards of the garden, Trump Tower is responsible for the maintenance of the space, which includes de-icing walking surfaces and shoveling the snow. Some participants noted that the sidewalk on street level was free and clear of similar hazards. To illuminate these issues further, AN sat down with Michelle Young, founder and publisher of Untapped Cities and an adjunct professor in urban planning at Columbia University. AN: As part of a deal with the city of New York that allowed for the construction of Trump Tower, then-businessman Donald Trump agreed to maintain what is called “privately-owned public space,” which includes the multi-level indoor plaza and a couple of the building’s roof terraces. What can you tell us about these POPS and the political role they play in our public discourse? Michelle Young: I wrote a piece last year after the election on Privately-Owned Public Space (POPS) because I was curious what would become of them—most people don’t even know they are out there. In the case of Trump Tower, it really feels like just the lobby of the Tower. It is very unclear from the street that it is actually a public space. [During development] Trump received over 105,000 square feet in additional area in exchange for pedestrian spaces and two landscaped terraces in Trump Tower. And then he received about the same amount again, not for adding public space, but for providing retail opportunities in the building. [This was common along fifth avenue in the 1970s and 80s.] Jerold S. Kayden, who wrote a book about POPS in New York City, approximates that one of those bonuses was about 8 stories…. So that means he got 28% of the FAR in additional square footage for zoning bonuses [POPS and retail]. Has Trump treated these POPS differently than other developers? All over the New York City there are POPS out of compliance, which includes: retail spaces that slowly take over public spaces (“retail creep”), or retailers’ signs in POPS that say “Customers Only,” or when gates are closed at a time when they are supposed to be open, and smaller things like not having a garbage can, bathrooms, etc. I think if we took the total aggregate of problems, the Trump Tower POPS are fairly well-maintained except for one of the terraces that is almost never open. I think one of the reasons there has been a lot of attention is the type of violation that Trump Tower has incurred. A specific case is a bench across from the elevator bank which has had a lot of controversy over the last couple of decades. First, the bench was replaced with flower pots, which was a fine. Then, last year Kayden himself launched new complaints against Trump Tower for removing the whole bench and replacing it with a retail kiosk that was selling “Make America Great Again” hats and other campaign merchandise. It’s a different issue altogether than neglect which is typically the problem in some of these POPS. Several organizations and political activist have been using the terrace of Trump Tower to host so-called teach-ins operating under the hashtag #teachtump. What is the effect of events like these when they happen in all communal spaces but especially at Trump Tower? I spoke at the first event and I think it was great to have it at Trump Tower, not just for political reasons, but also because of the level of security that is present there. The activists knew in advance that there might be some trouble so there was a careful staging of how and when people would enter the space. There was a lawyer on site who was knowledgeable of the issues and had all of the zoning documents on hand. Also, councilman Mark Levine was at the event and helped smooth things over when the New York Police Department and the Secret Service showed up. However, at the end of the day, it is a little bit… ridiculous that one needs a councilman and a lawyer to facilitate an event that was peaceful in a public space. The fact that this organization is currently holding protests there, I think, is a great thing. Originally it was supposed to be a one-time teach-in but I encouraged them to do it regularly because I think the symbolism of Trump Tower is effective. I think it’s a great way to highlight this issue of POPS and keeping developers accountable the rules of these spaces. A few months ago during the Women’s March in New York, Trump Tower was protected by a one block buffer on all sides and pedestrian traffic was limited in the area, bring into focus the entangled reality that comes with having a president with such extensive real estate holdings. What do these instances of exceptional spatial conditions illustrate about the privatization of public space? I think that one of the POPS that is particularly affected by privatization is 6 ½ avenue, which is a public space that runs through streets and buildings. It’s a really great initiative for New York City to support. The problem, again, is compliance and perceived inaccessibility. The lobby of the Parker Meridian hotel, for instance, is a part of 6 ½ Ave and was originally built as a POPS, but the owners installed a cafe at the entrance off of 57th street that is not welcoming to people who are not ordering food or coffee. There have been reports that people have been kicked out of the cafe for not buying something. That to me is a true privatization of public space. The area around Trump tower is like de facto privatization but is is not exactly the same. We hope that after these four years there will be a normalization but increased security has created disruptions in the public space especially the flow of people into and around the building’s POPS. And design plays a role? Yes, to that end New York City has updated their design principles for these space; in 2007 it released an update. So it is not a lack of effort on the part of New York City but obviously many of these places were built in the 1970s, 80s, and 90s, far before this update, so there is a big range in quality. Many have debated the role that President Trump’s background as developer and businessman will play in his presidency, especially with regard to urban development and infrastructure policy. What future do you see for shared space in our cities over the next four years under President Trump’s leadership? I haven’t yet seen a direct threat to public space because of the Trump administration. Mayor de Blasio remains very good about supporting public spaces, public amenities, and policies for the people. There are definitely concerns on the federal level that can impact New York City. For instance, the Jamaica Bay area is part of the Gateway National Recreation Area which is managed by the National Parks Service (NPS) so any cuts to the NPS could reach New York CIty.